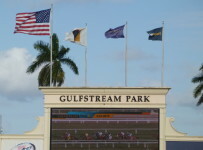 Saturday June 6 — Gulfstream Park will have three 60,000 stakes races today as part of a ten-race card with an early first post time of 12:30 p.m. Scheduled post time for the tenth race is 6:05 p.m. That should leave plenty of time for fans to do final handicapping and make bests on the Belmont Stakes with post time of 6:50 p.m.
* Parrot Key — 4th race, 6 ½ furlongs, dirt, 3-YOs and up. 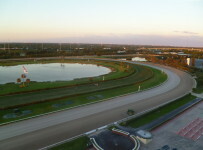 After upsetting the heavily favored Grande Shores in the Blue Heron Handicap on April 23, Loooch Racing Stables’ City of Weston (pictured above) will look to top that rival again in the Parrot Key. A 5-year-old son of Holy Bull, City of Weston captured the Blue Heron in his first start off the claim for trainer Peter Walder, who acquired the horse out of a $62,500 optional claimer at Gulfstream on March 15, in which the eight-time winner and $528,220-earner finished third. Walder was drawn to the horse’s back class (The flashy grey won the Gallant Bob Stakes (G3) in 2013) and thought he could help the horse regain his graded stakes-winning form. 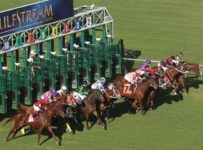 Grande Shores, who has finished first or second in 14 straight starts for trainer Stanley Gold, will look to turn the tables on City of Weston in the Parrot Key. The 7-year-old Jacks or Better Farm homebred notably finished second by a neck to the multiple graded-stakes winning Valid in Gulfstream’s Fred Hooper Stakes (G3) during the Championship Meet in February. He also won the Claiming Crown Rapid Transit Stakes last December. * Tiger Lily — eighth race, five furlongs turf, fillies and mares, 3-YO and up. Averill Racing and Silver Oak Stable’s R Free Roll, winner of the Honorable Miss Handicap (G2) last summer at Saratoga, will make her turf debut in the Tiger Lily. * Tangelo – ninth race, seven furlongs dirt, 3-YOs. R Sassy Lass and Dogwood Trail are likely favorites in a sever–horse field. R Free Lass is a stablemate of R Free Roll while Dogwood Trail is a stablemate of Grande Shores.